In response to a posting on the Brick City blog (with the above photograph) regarding the redevelopment of "blighted" residential areas of the city, I responded with the comments below. What do we do with areas like this? Do we let a developer come in and create a New Town St. Charles or Winghaven? Do we build suburban style housing on the existing street grid? Do we restore the homes that are currently here and build historic replicas around them? Of the three alternatives you've laid out, I would answer, "No, no, and no." Bringing in a developer to wipe a clean slate (bulldoze history, culture, and people) might be economically viable, but it displaces the existing residents literally and figuratively. This is wrong. Not merely in a moral sense, but with respect to the overall costs to society and the environment. Displacing people and communities simply pushes problems around and creates a defensive, separatist attitude. Building suburban style housing on the existing street grid would be disastrous. The street itself would be destroyed except for the use of the automobile. If you're going to go suburban, you might as well rip up the sidewalks. It won't really matter all that much if you maintain the street grid or modify it. The suburban house is a poor model to follow in general and in an urban setting, it is positively destructive and deadening. It results in people being alienated from their environments and from each other. Restoring the existing homes should absolutely be considered. Even if the cost is greater than the cost of demolishing and rebuilding, there is a sense of history and place inherent in these structures that can help to guide new construction in the area. A completely clean slate is a bad way to start. Why? Because it allows developers / builders / designers to effectively ignore the context and the site's history. Doing so paves the way for anonymous, lowest common denominator, completely "non-offensive" real estate driven investment (i.e. profiteering). What should we do? Let me think of this a little, although I believe there is a suggestion in my above comments of the appropriate course of action which mediates between complete obliteration of the existing fabric and an attempt at historical replication. An outline: Rebuild using the principles established by the urban design as it existed. That is, replicate the conceptual fabric for creating a new community that is based directly upon the pre-existing situation. Then, build structures that are honest, direct expressions of the needs, functions, materials, and construction methods used in creating the new homes. So the figure-ground image of the fully developed neighborhood might resemble the pre-existing figure ground (but not replicate it). The homes would varying in style and type. The homes would not need to necessarily be brick or follow the typology of the existing buildings. Consideration for the existing buildings should be a factor in the design of the new structures, but not the primary determinant of the exterior form. 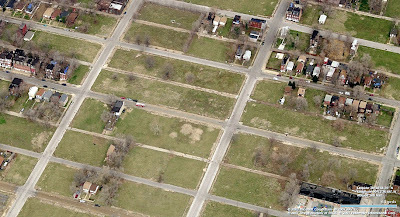 Otherwise, the exteriors become false masks over suburban crap without character or meaning. 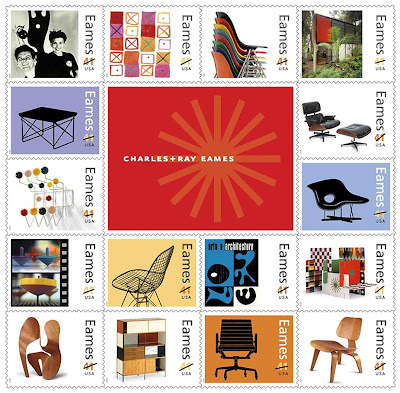 Ray & Charles Eames Stamps coming ! In the summer of 2008, these stamps will become available through the USPS. I can't wait . . . I'm sure they'll become collector's items. These stamps were designed by the remarkable Derry Noyes, who design[s] many of the stamps for the US Post Office. The first inklings of this possibility were 10 or 12 years ago when we (I am wearing my Eames Office hat here) first answered a request for research images. There is a wonderful familial connection there, as Derry is the daughter of Eli Noyes, who was an extremely close friend of Charles and Ray’s and the director of design at IBM. Slowly over this time period it blossomed to a full on set of 16 stamps to celebrate the richness of Charles and Ray’s work. We see the Eames House, La Chaise, the Lounge Chair, Crosspatch, House of Cards, the film Tops and more. Just think: How many Toys are on stamps? How many short films? This is just a great thing. Did anyone save some sheets of the Noguchi stamps of a few years back? 20 Fellows: Paths Taken, Lessons Learned is a commendable, substantive book that repays reading and viewing at many levels: visual, historical, inspirational, and personal. The ostensible purpose of the publication is to provide guidance for young architectural graduates from 20 St. Louis Chapter AIA Fellows. While fulfilling this mandate in an appealing, engaging manner, it also offers as a historical snapshot of St. Louis architectural practice in the fifty years from 1950 to 2000. It provides a more personal and at the same time more objective first person commentary on pursuing a career in architecture than can be reliably find elsewhere. In an age in which self-promotional marketing materials are often distributed in the guise critical monographs, this book fills an important niche. The book is the brain child of Jamie Cannon, FAIA. He and his unfailing wife Mary Jo are to be congratulated for taking a good idea, doggedly pursuing it, locating funding, soliciting written and visual contributions, editing and organizing them, arranging for excellent graphic design and high quality printing. If nothing else, the book is a professionally executed document of the thoughts, history, works, and advice of highly recognized and accomplished architects in this time and place (something worthwhile of itself). William Odell, FAIA of HOK. Photograph by Paul Rivera (p. 107). The book’s structure and layout (graphic design by Kiku Obata) is appropriate to the task of communicating each architect’s experiences, views and opinions on architecture as a meaningful, fulfilling profession. Each Fellow is allotted one chapter to offer advice, knowledge, and experience based upon their own personal history. The range of viewpoints and experiences is fortuitous including several designers of the highest caliber; practitioners involved a range of building types & scales, and successful architects working in private, public, and not-for-profit organizations. In addition to the more “stereotypical” career paths expected, individuals included represent dedication to architectural education, community activism, local politics, and historic preservation. Given its format, twenty brief chapters each authored by one Fellow, the book is an easy read. It can be viewed in discrete moments since each chapter features one Fellow’s writing with accompanying illustrations. 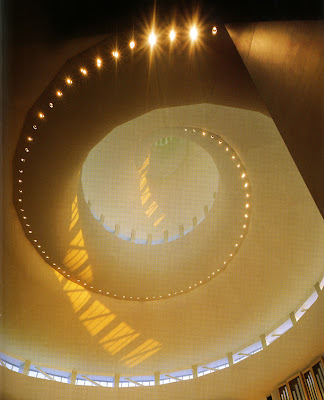 The book includes examples of world-class architectural photography and design. Albert B. Fuller, Jr., FAIA. 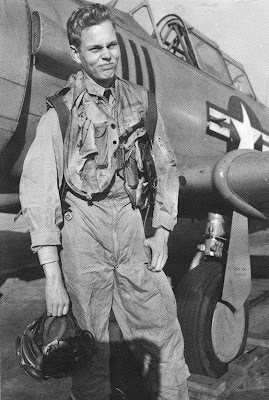 Naval Aviation Cadet Patrol Squadron 47. The inclusion of sketches, paintings, and personal memorabilia provides a wonderful sense of the individual behind the words and images. Poignant illustrations include a young Al Fuller in aviation gear, Gene Mackey’s evocative sketches, Dinos Michaelides’ Athens Polytechneion student ID, and Lou Saur’s objective yet personal record of his father’s workshop. Each architect has taken their own approach in developing their essay. Some offer opinions and advice for young aspiring architects. Others recount their educational and professional experiences in a manner that reveals the sometimes serendipitous nature of the development of a life. Some writings are philosophical and even polemical. I welcome the thoughtful commentary on architectural topics (Obata on design; Odell on the creative process) as well as societal issues (Cotton on economics; Danna on community outreach). The essays implicitly or explicitly address the impact of the culture of modernism. This generation of architects has experienced first-hand massive societal changes on a global scale -- economic, political, and military -- during the mid to late twentieth century. William A. Bowersox, FAIA of PowersBowersox. 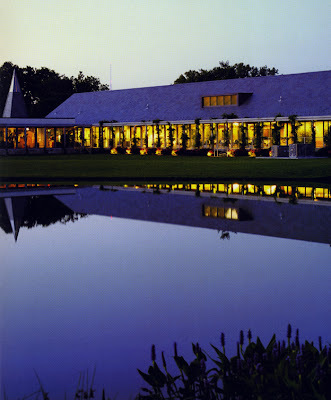 Forest Park Golf Clubhouse, Saint Louis, Missouri. (Photograph by Robert Pettus, p. 19). These architects were generally educated in the context of modernist philosophy of the post WWII era. The extent to which they respect and draw inspiration from works of the past is heartening. The fundamental importance of architectural history is evident. While International Modernism theoretically rejected the forms and habits of history, it’s clear that each of these architects has been informed and enlightened by visiting and studying the canonical architectural forms of the past (European, Mediterranean) as well as benefiting from non-traditional sources of inspiration (Asian, vernacular). These architects are invariably strong, independent minded thinkers and doers who’ve made substantive contributions to the profession. While the realms in which their activities vary including corporate offices, university buildings, and housing for the wealthy and the displaced, they generally demonstrate the validity of George Nikolajevich’s thesis regarding the imperative role of the individual of intelligence, will, determination, and belief. Eugene J. Mackey, III, FAIA. 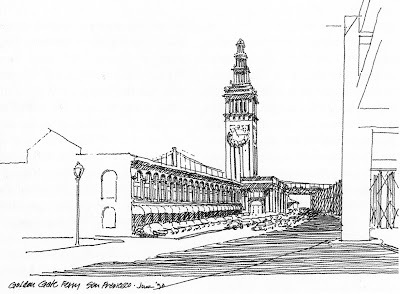 Sketch of the Golden Gate Ferry, San Francisco, 1990. While such sentiments may bring to mind authoritative architects like Frank Lloyd Wright and Mies van der Rohe, Nikolajevich makes clear the critical importance of meaningful collaboration between an architect and his or her client, consultants, and associates when he writes, “ . . . a design team resembles a jazz band where the individual member’s expression remains intact, and at the same time has a transformative effect on the work of other team members” (p. 91). Some aspects detract from the book’s overall strengths. The quality of the texts vary revealing the extent to which architects may prefer the use of the written word over visual and oral communication. One approach to overcoming this limitation would be to conduct interviews of those architects who express themselves especially well through the spoken word. Of course such an undertaking would involve considerably more effort and expense. 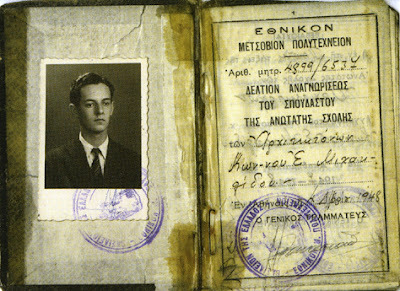 Student Identification Booklet, Athens Polytechnion, 1948. Other details could be improved upon in subsequent versions and I do hope this kind of collaborative effort for the benefit of young professionals will be repeated in the future. Providing an index would be helpful for contemporary readers as well as for future historians. 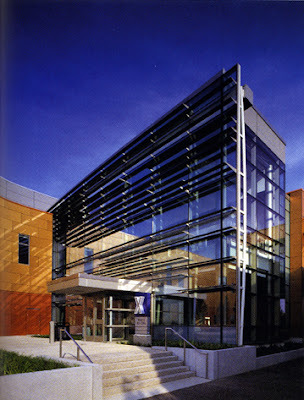 These architects are invariably connected with one another professionally, educationally, and/or personally. Providing an index would be a meaningful step toward integrating these individual essays into an even more coherent, cohesive document. Another way to expand the book’s scope would be to mount an exhibition, conference, roundtable discussion or other similar event from which many stories would undoubtedly emerge of historical interest and of practical use for young architects starting out along with the added benefit to young architects of the opportunity to personally meet these esteemed professionals. While the list of St. Louis Chapter Fellows, Gold Honor and Gold Medal Recipients, provided (p. 164) offers some background and context, a variety of additional features could meaningfully expand its scope and impact. A timeline and/or brief history of the St. Louis Chapter AIA would help to place these essays into a meaningful, well-rounded context. Similarly, an essay by a historian familiar with the development of the architectural profession in St. Louis would help to flesh out the overriding concerns and themes forming the implicit context of individual careers. Of course, there have been several worthwhile publications addressing such concerns including Modern Architecture in St. Louis, The Way We Came, A Guide to St. Louis Architecture, and the many excellent Landmarks Association publications. Gyo Obata, FAIA of HOK. Community of Christ Church, Independence, Missouri. It takes special people with unusual focus and determination for a project of this nature to balance an individual’s desire to protect and enhance their legacy for the collective benefit of the profession and our culture. My hat is off to Jamie Cannon for following through on his idea, bringing it into realization with quality, personal meaning, and further benefiting the future of our profession. Finally, I want to make reference to the excellent essay by Robert W. Duffy for the book's Foreword. I commend it to you as a succinct expression of the power and meaning architecture can have for people and communities unknown to the original architect. I will address his evocative text in a future blog entry.